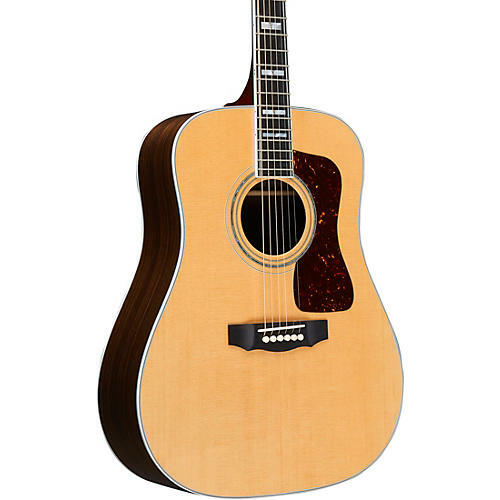 First introduced in 1968 as a special-order top-of-the-line model, the D-55 was so well-received that Guild added it into the regular production line by 1974. Famously played by Tommy Smothers on the Smothers Brothers Show in the 1960s, the D-55 grew in both popularity and longevity over the decades, finding homes in the hands of more contemporary artists like Waylon Jennings, Billie Joe Armstrong, and David Nail. The most anticipated return of a Guild acoustic to date, the 2017 Guild D-55 is back and better than ever. The D-55 remains true to all the premium appointments of its 1968 predecessor, including a AAA Sitka spruce top, solid Indian Rosewood back and sides, ebony fingerboard and bridge, and nitrocellulose finish. Internal refinements include scalloped Adirondack bracing as well as an improved dovetail neck-joint, hand fit to make this generation of D-55 the lightest, loudest, and best-sounding yet. The D-55 showcases Guild’s most recognizable headstock which is fully bound and features the Guild “Peak and Shield” inlay combination over a figured ebony overlay. The matching ebony fingerboard is also fully bound and inlayed with Guild’s iconic abalone/pearl “V-Blocks” and multi-line “railroad track” purfling on the bass and treble sides. The D-55’s fingerboard is set on an all-mahogany neck with beautiful walnut center seam running the length of the heel to headstock. The D-55’s nitro finish is beautiful on this natural top and is hand sprayed for minimum thickness and maximum resonance that will only get better with age. Ships with Guild’s Premium humidified hardshell case.